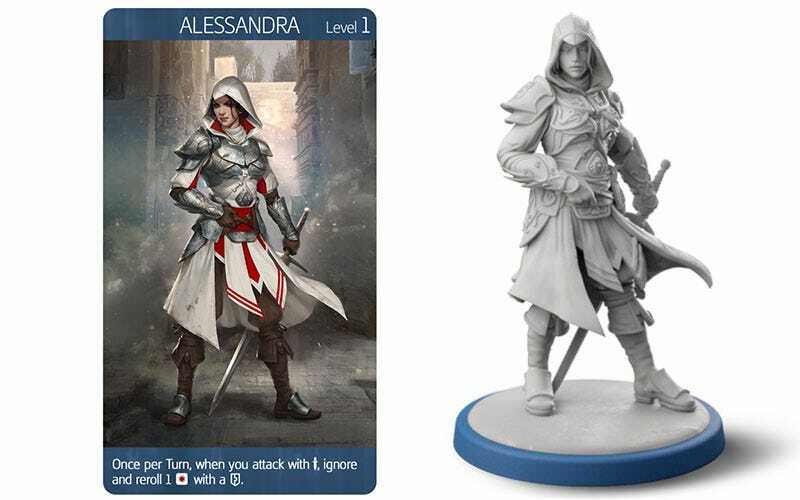 In 2014, there was an Assassin’s Creed board game that wasn’t that great. In 2018, there’s a new one that will hopefully be a lot better. That first effort, Arena, had its heart in the right place, but was a bit too abstract and poorly-presented to really nail the look and feel of the games. So the new effort, Assassin’s Creed: Brotherhood of Venice, is cutting straight to the heart of the series: story, stealth, close-range combat and assassination. The game will be playable either solo or with up to three friends cooperatively against an AI-controlled enemy. Along the way there’ll be upgrades for characters and your HQ, while also working in a few cameos from the Ezio games like Leonardo da Vinci, Lucrezia Borgia and Ezio himself. Unlike V-Commandos, which used cardboard tokens to represent characters, Brotherhood of Venice will include “dozens” of detailed miniatures, of both your Assassins and enemy targets and guards as well. The game’s Kickstarter will launch in November.